2 PTs – Justyn Barnes Media Ltd. I first got the idea of putting them together last summer when Paul – with whom I’d worked on various projects over the past few years – mentioned to me that he’d drawn the 1953 Coronation Ashes (he’s been around a while… ), sixty years before the latest England-Australia series that was already underway. Having worked with Phil as his ghostwriter, I knew that aside from his cricket career, he is a keen painter (Norman ‘Fat Boy Slim’ Cook owns ‘a Tufnell’… ) and the unofficial art correspondent for The One Show, so it seemed like a natural. I pitched the idea to the Beeb. I didn’t hear anything for a month or so, but then out of the blue, they emailed. With the Ashes series in progress, I suggested Lord’s as the venue and a couple of weeks later we were there filming. Tuffers, of course, had a wild reputation in his youth, and Paul is a a law unto himself, a force of nature. I had a feeling they’d hit it off. And, happily, they clicked immediately. The few hours we spent filming at the Home of Cricket were hilarious. I was later told that the whole BBC production office in Scotland came to a standstill as everyone gathered round to watch the rushes. Then the Beeb decided they wanted Paul to come on the live show too. I was a bit scared. And as expected Paul caused chaos. But in a good way, and the show’s audience loved it. Soon he was invited back. And I was really pleased when the BBC suggested doing a mini-series of items where Paul teaches Phil how to draw different sports. 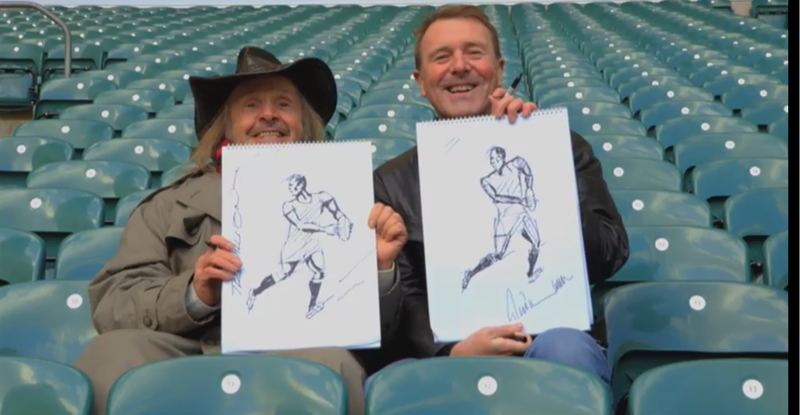 The first one at Twickenham showed again their easy rapport and also demonstrated Phil’s considerable artistic flair. The only problem is that his sketch was so good, people have been asking Paul today whether he drew it for him. I was there and I can honestly say that he didn’t, and that the sketch was done first time; no extra takes.